Deliver a training course over a few months [new subscriber workflow]. Send a sales email when a free trial period has run out [date-specific workflow]. Remind customers when a yearly membership is due to expire [anniversary workflow]. Use an RSS feed on your website to provide automated updates to customers [site update workflow]. Guide potential customers through a free "test drive" of your website or product [new subscriber workflow]. Promote a new product, service, event or e-book that will be available to buy soon [date-specific workflow]. Deliver a multi-part welcome package to customers who achieve VIP status [segment-triggered workflow]. Send subscribers a birthday message [anniversary workflow]. Deliver the appropriate educational course when a subscriber progresses to the next level [segment-triggered workflow]. Reach out to customers who have been inactive for a certain period of time, to entice them back with a special offer [date-specific workflow]. This section is a brief overview of what you can do with workflows and how to set them up. When someone joins a list — This type of workflow is triggered to send when someone signs up through a subscribe form. A date — This is triggered by a specific date for each subscriber with the year taken into account. It could be a purchase date or a next appointment due date, where the workflow is set to send sometime on, before or after the date. An anniversary of a date — This is triggered by a date associated with the subscriber that marks the day of an annual, recurring event. Date of birth is a common example. So if a subscriber's date of birth is 29 May 1974, we ignore the year and send a birthday email on (or near) May 29 each year. Site or blog updates — You can use this trigger to import an RSS feed into your email, and set it to send on a regular basis. 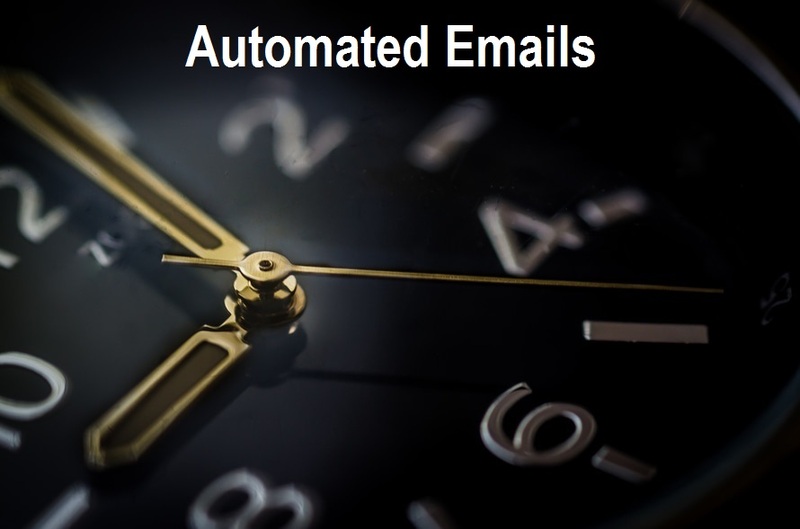 This is a great way to automate newsletters for your website. When someone enters a segment — This workflow is triggered by a subscriber becoming part of a segment for the first time. This can be used to send timely, personalized workflows based on contact behaviour or data. When someone exits a segment — This workflow is triggered by a subscriber leaving a segment for the first time. You could use this trigger, for example, to re-engage with customers who haven't used your product for some time. Note: The two date-based workflows require a date custom field to work with. If your chosen subscriber list doesn't have one, you will be prompted to create a new one. Workflows can be a single email or a series of emails that are triggered to send one after the other. For example, a marketer could use a new subscriber workflow to deliver a series of welcome emails to new customers about the services their company offers. To build a series, keep clicking Add a new email to this workflow. The example above could be expanded from three emails to 10, or more. There is no limit to the number of emails you can add. The example workflow series pictured above is set up to send to "Everyone in the list," but you can also create separate emails to target segments of your list. This can be done with any type of workflow. This could be used by a clothing retailer for men and women. On signup, the workflow triggers and the recipient is sent content specific to their gender, defined by segment. Tip: To ensure new subscribers are added to one of the segments you have created a workflow for, set the custom field on your form to "required" — meaning the form cannot be submitted until the field is completed. Note: If you select more than one segment it means the email will be sent to people who are members of segment A, segment B, segment C, or any combination thereof. 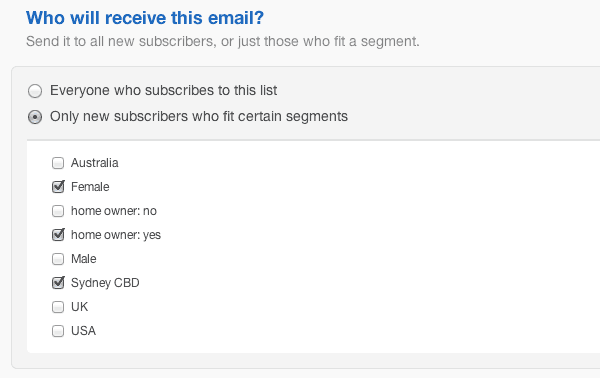 To email subscribers who only belong to all three segments, first create a segment using AND to group people who match criteria A, B and C, then select that segment when you're setting up the workflow. If an email is triggered to send when you're editing, the last version you had saved will be sent — not the version you're currently working on. Editing will not affect workflow reports. This also stops any emails that were already triggered. 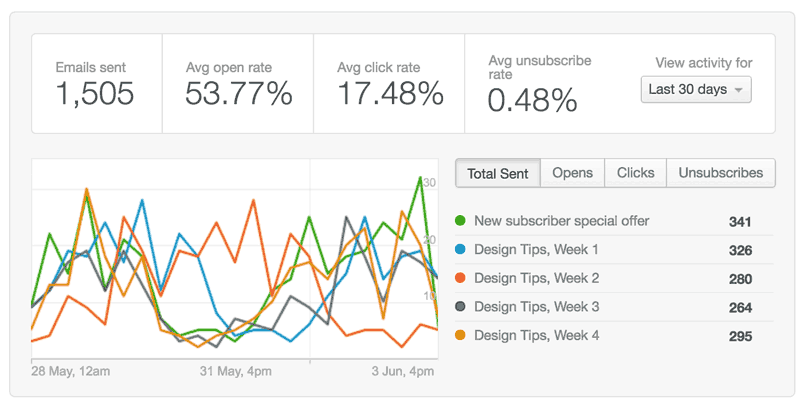 For example, say you have a new subscriber workflow made up of five emails. Someone joins your list and gets the first two emails. Then you switch the workflow to paused; this person will not get the remaining three emails. You can also delete workflows but keep in mind that this will delete all the reporting data for them as well. To delete a workflow, open Automation. On the following page hover your cursor over the workflow row, then click the trash can icon that appears on the right. When a workflow starts being sent, reports will be generated. Reports are viewable after you click on an active or paused workflow's name. You can also drill down to see which links were clicked, bounces, and more by clicking the Full report button. This button will not appear until the workflow has sent at least one email. 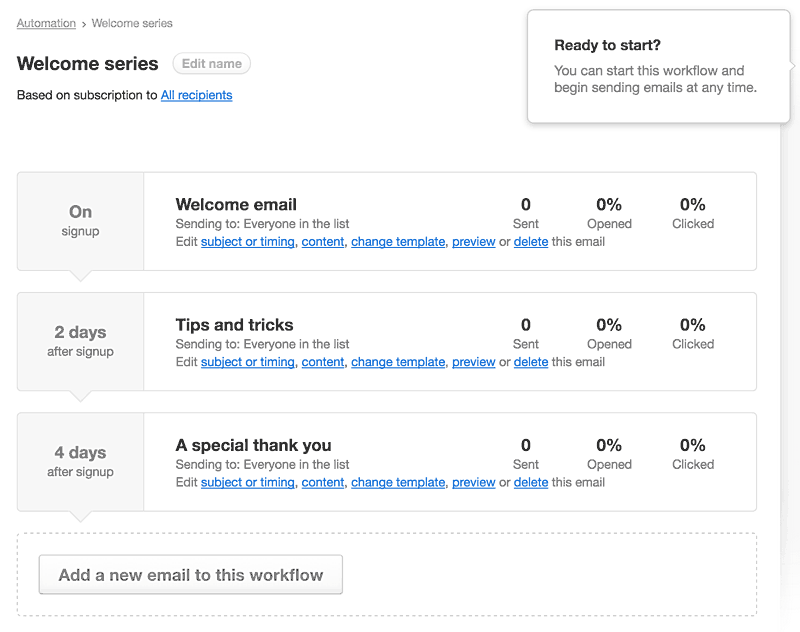 If I create a new subscriber workflow, will it be sent to people already on the mailing list? No, because a new subscriber workflow can only be triggered by the sign up action. Will importing subscribers trigger a new subscriber workflow? Except for segment-triggered workflows, importing subscribers from a file will not trigger the workflow, nor will adding new subscribers to a list by manually typing them in. However, if you have the recipient's permission, you can sign them up through a public subscribe form for the list. By adding them "organically" the workflow will be triggered. Will a workflow be triggered if sign up is through an opt-in checkbox on another form? Yes. If your client has multiple lists, opt-in checkboxes for those lists can be added to an HTML subscribe form. If a subscriber checks any of those boxes and the selected lists have active new subscriber workflows, the subscriber will be sent the workflow email. Can I change how a workflow is triggered? No, because a workflow is defined by its trigger type. If you need to change that, you will have to set up a whole new workflow. If someone unsubscribes then resubscribes, will it start the workflow again? No, if a person has unsubscribed from your list, subscribing again will not trigger the workflow again. If the person resubscribed when they were part way through receiving a series of workflow emails, they will get any that are still due to send but it is not possible for them to go back to the start. If a subscriber leaves a segment part-way through a segment-triggered workflow series, will the emails stop? No, the workflow series will continue to send until completion. One workaround is to filter the workflow by the same segment that triggered it, which will prevent the remainder of the workflow series from being sent to subscribers who leave the segment. What time of day are workflow emails sent? Date-based workflows (for anniversaries and the exact match of a date) are sent at 12 midnight on the date that is specified. For example, if you have an anniversary workflow set for a birthday email, it will be sent the first minute that it is the subscriber's birthday.